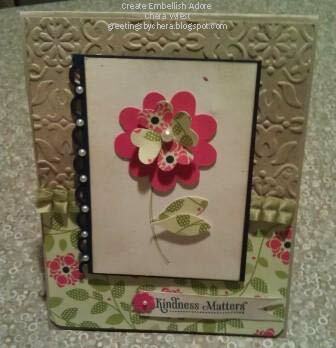 I have been slacking on some card making lately. Not that I haven't had cards to make, just not a lot of the energy to complete them. Thought it might be the time change, but honestly I think its just the 'more work, less people' kicking into high gear. Nonetheless, some of my mojo shined and I got this together. They needed to be mailed, so the pictures are not where they usually are, since it was snap snap and out to the post office. 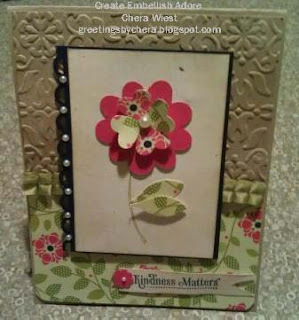 I used a variety of materials - Big Shot for the Vintage Embossing Folder on the Crumb Cake, and the large Flower in Melon Mambo. I used the scalloped edge punch of Night of Navy and added pearls. Using the Ruffled ribbon, I attached it to the top of the Cheerful Treats DSP (Hostess) which is really cute! The greens for the flower are punched from the Blossoms builder punch and I used a dimensional under the top one. Kindness Matters was stamped in Night of Navy and then sponged with Crumb Cake. I added a itty bitty flower to the corner. The little flower in the center is made with the tiny heart punch with a pearl in the center. I really like that vintage embossing folder and how it looks on the crumb cake!